Adela Fonts (Barcelona, Spain) on 27 March 2019 in Documentary & Street and Portfolio. @By Marie: Merci beaucoup Marie! J'ai visité votre magnifique page. J'ai aimé regarder les premières images. Je continuerai à lui rendre visite avec plaisir! Votre Noa et votre fille vont bien? Gros bisous chère amie! You have a fine eye for this great reflections and situations. Compliment! @Ralf Kesper: It's one of my biggest photographic hobbies ... look and look for interesting reflections that explain different things to reality. Situations that invite the viewer to draw their own impressions and enjoy their own imagination ... Thank you very much for your words. Best regards Ralf! @grouser: Good news dear friend! Oui Adela, tout le monde va bien, merci. @By Marie: De bonnes nouvelles Marie! Je suis hereuse! @Jaya: J'aime qu'il te plaise Jaya! Tu te joue admirablement des réflexions ! @Yves: J'aime qu'il te plaise Yves! I love these white tables and chairs and the play of light and shadow here !!!! Very nice capture here Adela. Excellent reflections and shadows. @STEED: Glad you like it! Thanks a lot! Hugs to you dear friend! One of your quintessential window world shots that I always enjoy ! 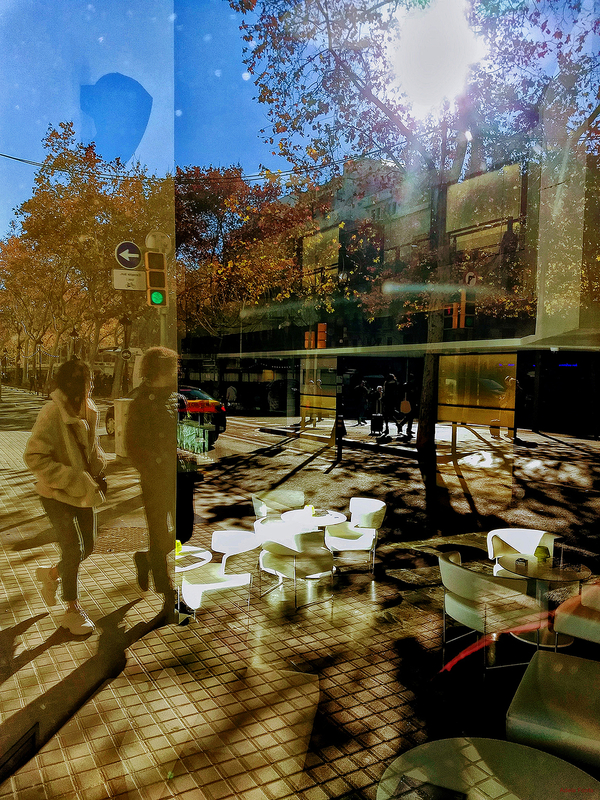 @Rick: One of my photographic passions is the construction of scenes that include reflections and urban reality. Getting it is a great pleasure for me. Thank you very much for your words Rick! Beautiful dramatic light and shadows captured here! Your reflections often require a second look and some thought. Very interesting. A wonderful scene with fabulous reflections! The light is green and they are walking. The tables are ready! A splendid image of wonderful reflections.